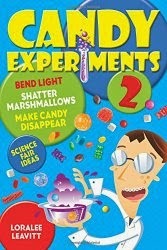 Since we love testing sour candy, we decided that sour Crybaby eggs would be really fun for the acid test. We cracked them open, discovered the sour powder inside the hollow eggs, and poured it into water for the acid test. But the powder didn't seem to dissolve, and when I mixed in baking soda, there was no reaction. Why not? I got some new powder, mixed it with water, and microwaved it, knowing that things dissolve faster in warmer water. To my surprise, not only did the powder dissolve, but I got floating puddles on top. What was it? See "carnuba wax" halfway down? I'm guessing that's our culprit, and that the wax has been added to the sour powder to keep it from being dissolved by the moisture in the gum. Once we had separated out the wax and dissolved the powder, it was time to try the acid test again. This time, the dissolved sour powder did bubble when the baking soda was added. Test successful--and mystery solved.